I decorated this little multi-tiered cake from a drawing that my niece made for me. Hers was so sweet that I thought it should taste that way, too. I like the play on words. 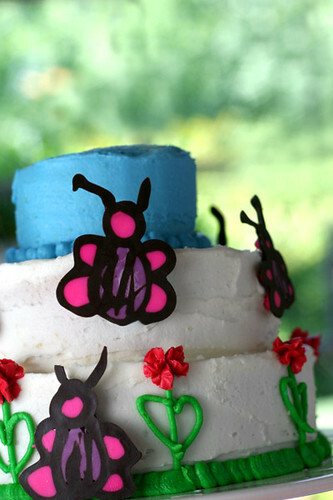 Butterfly, buttercream. Very witty! Love both of your blogs! You are so creative and really good at decorating cakes... cupcakes... anything! josephine - glad you like it. I love the designs of your cakes! They are all so sweet to look at. Do you use a regular buttercream to decorate? Adorable! The fun thing about cakes is that you can get inspiration anywhere! Looks adorable. I'd love to see the "sketch". More Than One Sweet Tooth - yes, it's the basic recipe. dizzy mom - There's a link in the post. That is soooo cute! I love making cakes and that looks like it would be so much fun to do!!! I'm just a fan saying "Hi"
Just wanted to let you know that I've got 2 awards for your blog. Feel free to grab them from my blog when you've got the chance. my daughter did a drawing for me of how the cake should look like for her 7th birthday and i created a very similar looking cake to yours. my daughter was very surprised that i could bring her drawing to life, so to speak! You are so very, very talented! You should write a book! (I'm an editor, and I'm telling you that you could succeed with a book!) Fabulous photos and ideas! Keep up the wonderful work and thank you for sharing it with us! How whimsical and cute!!! Love it, I am going to have to do this for Father's Day and have my girls draw the decorations. What an AWESOME idea! Thanks! Love both of your blogs! I'm always impressed with the photos --perfect lighting and color! mmmmm! What kind of camera do you use? I love this cake, it is so adorable. I really want to do a tiered cake for my sons 3 year old birthday. Do you have any ideas you can pass along. I might just do this one. Love it! ideas would be great... tmsmart@mac.com. Wow, 2 blogs. Now this is just plain exciting. However do you do it all? AW, so sweet of you. The cake looks very cute!